The San Luis Obispo Tribune has inspired me to tell this full story Nationally as seen in the Tribune E-Mail May 27, 2009 below. Several of us here have received your e-mails and often we have similar thoughts about them. I think we’re confused about what we’re seeing here and what the story should be. Those are two huge points of concern for any news organization. If the judge has denied your request for a trial, then what’s your next step? If the judge has said the evidence you presented is not sufficient to show OCSD or other agencies committed wrongdoings, then what’s your next move? Why should Abel Maldonado or Blakeslee get involved and how might they help/change the situation? I don’t think anyone doubts flooding has gone on Highway 1, but if two judges have turned down your request for a trial the news media can’t serve as a vehicle of protest unless you have a formal protest (not just with us; with some official body). I think we all have to know why we should cover this story and have the information presented in a clear fashion that makes immediate sense to us. 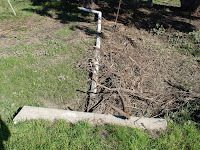 With this decision, It is now legal for local and State Government to use storm water drainage systems for other uses then storm water, while allowing Caltrans to raise a State Highway and then to grade and shovel contaminated storm water debris into our States Drainage Systems as seen in documents and statements presented to Judge Tangeman and the Second Appellate Court! From the Appellate Court Statements as seen in their PDF decision attached below; they have ignored factual testimony at trial from Sutton, Davis and Brebes along with photo evidence withheld by Union Pacific Rail Road and the County Of San Luis Obispo in exhibit # 579! The Second Appellate Court on Page 8 of their decision Acknowledge the Videos and photos showing Caltrans Grading and shoveling Contaminated Storm Water and Debris into this California State Drainage System while the Oceano Community Service District Videos show their Discharge of their Well # 8 Well Water into this Storm Water Drainage system daily! The Second Appellate Court Blames Pismo Oceano Vegetable Exchange for making County Permitted drainage changes that the County had required POVE to raise their outlet of the RR/POVE/OCSD/County/Caltrans storm water retention pond! I will be appealing this to the California Supreme Court and our California residents. Please view Caltrans and OCSD actions on YOUTUBE under Caltrans and Inverse Condemnation as these videos were presented to the Second Appellate Court and Judge Tangeman as talked about in their June 28, 2010 Inverse Condemnation Decision! Please Review my web-site www.oceanonursery.com to view what the Appellate Court viewed as evidence in their decision that now affects our California Constitution and California citizens public safety! Please again review the web-site www.oceanonursery.com and bring this to all of the State Assembly Members and State Senators attention. The First YOUTUBE video on this web-site shows why our State Highway in Oceano California has been used by Caltrans and the County Of San Luis Obispo for storm water retention! County of San Luis Obispo documents withheld from discovery shows how this storm water affected the Oceano County Airport and the Baughman property in 2002 and prior! Caltrans Steve Price and San Luis Obispo County Glenn Priddy, both explain that this flooding can be abated in these YOUTUBE videos! It is unfortunate that San Luis Obispo County chose to withhold this evidence from discovery and then redact the names on this evidence; once the County provided this evidence after trial and San Luis Obispo--Superior Court Judge Martin J. Tangeman’s August 5, 2008 Inverse Condemnation Decision. California residents Health and Safety has been jeopardized as seen on my web-site www.oceanonursery.com and YOUTUBE videos under---Caltrans---Inverse Condemnation—County Of San Luis Obispo—Oceano Community Service District—California State Senators and Assemblymember—California Highway Patrol. Lets, make a difference in California and correct this flooding problem on our State Highway in 2010! Nick, My next step is to hope that California Residents will ask all News Media, State Senators and State Assemblymembers. Why if this flooding of our State Highway can be abated for only $43,295.00--Then why is this flooding not being abated today with our State tax dollars? Why would Caltrans Raise a State Highway with their drainage concerns? Why would a Superior Court Judge not want evidence admitted in trial as preseted to him again on August 5, 2008? Judge Tangeman States in the Courts Transcripts of August 5, 2008 after reviewing the videos of Caltrans grading debris into this drainage system and OCSD dredging debris into this drainage system. "I also find that there was insufficent evidence of Causation as to Oceano Community Service District, County Of San Luis Obispo, State of California as between their acts and conduct and the flooding, especially given the problems associated with the drainage across the private property of the Railroad and/or of P.O.V.E., without necessity to distinguish between those two entities." Nick, from the pictures below! Is it normal for Government to make dams as seen in the OCSD pipe in storm water drainage systems? Is it normal for Caltrans to shovel Storm water debris into storm water drainage systems, as judge Tangeman stated "I also find that there was insufficent evidence of Causation"
Nick Wilson, remember what Lieutenant Governor, Abel Maldonado stated "I hope that you continue to seek legal counsel and that this very difficult situation will be resolved soon." Nick Wilson, my Pacific Capital Bank---SBA--U.S.Small Business Administration Loan Agreement States in my Deed Of Trust with First Bank Of San Luis Obispo/Pacific Capital Bank; that I am required on Page 4 of this Deed Of Trust to Fight Inverse Condemnation of my property! It is unfortunate that I can no longer use this property per Caltrans actions! Caltrans expains their liability to the Pacific Ocean in this YOUTUBE Video, While the County of San Luis Obispo talks about their sidewalks and streets being a drainage system and the 1 Million dollers they would have to spend down stream as seen in exhibit # 579 that the County withheld from Discovery! It has been seven years since my business Oceano Nursery began flooding from Caltrans drainage changes above, mixed with the Oceano Community Service District use of this Storm Water Drainage system. I obtained my SBA loan #6641964009 in 2003 with First Bank of San Luis Obispo. Nick Wilson, of the San Luis Obispo Tribune. Why should the Tribune/McClatchy News cover this story? What if this flooding was flooding the Tribune property for seven years and you found out that it could be abated for only $43,295.00 Dollars? What if the Tribune/McClatchy News Found Caltrans shoveling contaminated debris into the storm water drainage channel that protected the Tribune and its employees from flooding? Nick, Flooding February 5, 2010-should our children be put in danger? Notice the State Highway Patrol helping? Nick, view the YOUTube video of Caltrans April 2, 2008?? Do you feel Caltrans should be grading storm debris into this drainage channel at 3:am as seen on YOUTUBE? Nick, are these actions above, being a good neighbor as seen on YOUTUBE? Nick, How could a Superior Court Judge make this type of error and then place a $200,000.00 judgment on me? Senator.Maldonado@sen.ca.gov and Assemblymember.blakeslee@asm.ca.gov can help! Nick, This is just one statement in one County document that the County of San Luis Obispo withheld from Discovery, in exhibit # 579 showing what was happening in Oceano before your State Highway 1 began flooding! Nick, Notice the photo above of the Baughman property not flooding in 2010 while State Highway 1 and my property is now used for this Storm Water Retention? Nick, in response to your E-Mail February 3, 2010 Check out these Caltrans documents P. 4 and P. 5-------PDF and Caltrans talking about the Baughman property! Caltrans, OCSD and County using State Hwy 1 for a storm water retention PDF. Nick Wilson, It has been seven years since my business Oceano Nursery began flooding from Caltrans drainage changes above, mixed with the Oceano Community Service District use of this Storm Water Drainage system. I obtained my SBA loan #6641964009 in 2003 with First Bank of San Luis Obispo. Why should the Tribune/McClatchy News cover this story? What if this flooding was flooding the Tribune property for seven years and you found out that it could be abated for only $43,295.00 Dollars? What if the Tribune/McClatchy News Found Caltrans shoveling contaminated debris into the storm water drainage channel that protected the Tribune and its employees from flooding? Nick, Flooding February 5, 2010-should our children be put in danger? Notice the State Highway Patrol helping? Nick,view the following videos and then decide if this is a news worthy story! Nick, after viewing these videos. Do you think this person should be falling down in these flooded waters? 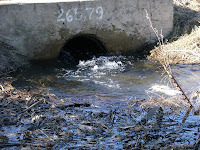 Do you feel Caltrans should be grading storm debris into this drainage channel? Nick, when the news media does do this story, remember what Judge Tangeman stated about Caltrans shoveling debris into this drainage channel! Nick, are these actions above, being a good neighbor? Nick, How could a Superior Court Judge make this type of error and then place a $200,000.00 judgment on myself--Pacific Capital Bank and this SBA loan? Nick, This is just one statement in one County document that the County of San Luis Obispo withheld from Discovery, showing what was happening in Oceano before your State Highway 1 began flooding! Nick, Notice the photo above of the Baughman property not flooding in 2010 while State Highway 1 is closed and my property is now used for this Storm Water Retention? Check out these Caltrans documents P. 4 and P. 5-------PDF and Caltrans talking about the Baughman property! Which document shows that the flooding could have been abated for $43k or so? What year was that? Is that relevant now? If so, how? Nick, what do you think of this statement by Caltrans as seen in P. 2 above from the Caltrans documents? Nick, This is what Caltrans has told the Regional Water Quality Control Board after trial as seen in this E-Mail to the RWQCB. This affects every California Resident! Caltrans-D-5 Pete_Riegelhuth January 12, 2009 Statement to.RWQCB.PDF. Nick, This is the Caltrans, testimony Judge Tangeman heard from Caltrans. Does the SLO Tribune think this is proper and safe for San Luis Obispo and State residents? Question. Mr. Fry, Exhibit # 1475 on the screen there is the same as Exhibit 11 in your deposition transcript. Can you describe for me the materials that you see here on Highway 1? Question. Now in your practice as a Maintenance Supervisor and as a lead worker, has it consistently been your practice to somehow, I guess, blade this material to the side of the road? Nick, notice the stalled cars and State Highway 1 closed. Is it normal for Caltrans to protect private property like the Baugnman's and flood State Highways for one property owners benefit? Why would Judge Tangeman allow this? Nick, Why would San Luis Obispo County Want to withhold evidence from discovery? Check out this E-Mail April 23, 2008 from OCSD before trial and Judge Tangemans decision from the County Of San Luis Obispo that withheld the Baughman evidence from Discovery. I spoke with Dean Benedix at SLO County and he advised me that the County can not work with individuals who have law suits pending against the County. They also can not provide anything in writing since anything in writing is potentially part of any lawsuit. I believe this to be standard operating policy for most public agencies. I would recommend that we appoint a new alternate member to replace Director Bookout on the Zone 3 committee. If we do not do that, we will only have the primary member who is Director Dean. Nick Wilson, Thank You For Your Help And Great Journalism With This Difficult Community Story. California News Media, San Luis Obispo Tribune Staff and Reporters. The attached Appellant's Reply Brief Page 4 and 5 sums up this Web-Site with Caltrans, County of San Luis Obispo, Oceano Community Service District and Union Pacific Railroads use of this drainage system that now floods our State Highway 1 every time it rains! It is unfortunate that the County of San Luis Obispo chose to withhold evidence from discovery P.6 and P.7 "Baughman Property and Photos" This could be a safe Highway today for $43,295.00! Bookout vs. State of California Appellants Reply Brief Second Appellate District, Six PDF. Nick, this is part of our Appants brief P. 4 "Constant shoveling and grading of debris into drainage chanel by Caltrans. (RT Vol 4 Pgs 916-917, 920; Exhibits 1466-1467, 1513-1519)"
McClatchy News, should these school children safety be put in danger as seen in this Appellate brief and now this flooding February 9, 2010 so that Caltrans does not flood the Baughman property?? Nick, Notice Caltrans waiving as they close this State Highway in order to not flood the Baughman property! Nick, Shouldn't Caltrans be fixing this problem rather then waiving?